We arrived early since we wanted to have some time for shopping. Well – the city isn’t what you call beautiful so it wasn’t worth it at all. At the Sportpaleis we meet some fans who are already waiting for the doors to open. I remember a Brazil guy, Ivan and some Russians. Well – if you know who you are leave a comment here so I can add your names. Unfortunately all we got were seating tickets, faaaar away from the stage. Unfortunately not far away enough to not notice Marie’s problems during Wish I could fly. Sharon den Adel rocked the house before Roxette and I really liked the Belgian audience. On this first show Marie and Per appear on stage together – out of the blue, practically speaking. While Per just has to make one step Marie has to find her way to the microphone. Seeing this my first thought is: “Hmm, why did she agree to do it like this?” She can barely see something and has problems to walk over. It’s obvious. Wish I could fly starts and I am really nervous. Marie sings “Halfway through the night” three times in a row and I feel totally sorry for her. Nothing I can do from that far off. All I can do is hope that she doesn’t care and she really sings the rest of the song quite ok. My friend and I are worried about her in the break but she proves us wrong. She totally rocks her socks off during the second set. She’s great on The Look and Joyride and she sings so good on It must have been love and Listen to your heart. Yet – I feel like I need to support her. Unfortunately we have to go back to Düsseldorf in the night and arrive late (or early) at 3 am. 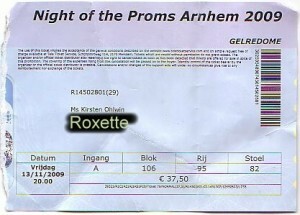 We could have been there earliert but we waited for Roxette at the backstage entrance and I was really happy that Per decided to come to us after the show. We were not many, maybe around 10. He told us that Marie has a sore throat and doesn’t feel well. He signs stuff, everyone gets a photo and we chat a bit. When he left (with the words: “We’re here tomorrow. Same songs, different lyrics”, I won’t ever forget it, haha) everybody was happy. We didn’t even notice that Marie passed by while we were talking with Per. So, arriving in Düsseldorf I decided to go back to Antwerp the next day. Not to let me entertain. No, just to support Marie. I didn’t even have a ticket and I just drove 230 km without knowing if I could get in in the end. Fortunately I could.. I was lucky! Evgeny already had tickets for Antwerp but couldn’t go because of his Visa problems. His friend Emil sold me Evgeny’s ticket. If I didn’t say thank you until now: Thank you! So I didn’t have to worry about a ticket. My friend couldn’t join me so I was alone this time – just to meet some friends in Antwerpen. I arrived early (14.00) and only a few people were there. Since I had a standing ticket for this night I knew everything would be more exciting than the night before. And since there was a huge catwalk in Belgium and The Netherlands we even had to decide whether to stand on the left or the right. Usually the left side was always Marie’s and the right side Per’s. Soon a lot of people stood on the left of the entrance so we decided to try it on the right. Good choice – we made it to the front row and could stand next to each other and in the end it turned out that there’s no left or right anymore. Both standing quite in the middle of the stage everybody could see Per AND Marie, left or right – it didn’t matter (except one wanted to catch Per’s guitar picks). My decision to come back was the right to make. Again – on Wish I could fly both appeared together and Marie had to make another 10 steps to the mic, this not working at all. Again – she had problems with the text but everyone around including me screamed and sang with her, helped her through this song and we showed our support with all we had. During the ballads I kind of had the feeling that she was looking for help in the audience. She looked at us all the time, it was like she was trying to read the text from our lips. Well, we did our best. Even worse – her voice was just not there. We felt so sorry for her. She must have been totally ill that night but we could see she was fighting like hell and we loved her even more for this. Still – I couldn’t stop worrying and I couldn’t enjoy the Roxette performance at all. This was the worst of all 14 shows I have seen. I fellt sorry for Marie and hoped the several thousand people in the Sportpaleis weren’t too disappointed, especially since I knew she can do much better and she proved it only some weeks later. 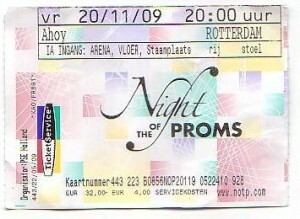 Unfortunately the most videos on YouTube you find when you search Roxette and Night of the Proms are from this night. Bad luck… or Murphy’s law. Whatever you want to call it. This show didn’t turn up in my personal “schedule” until three days before the concert. Well – we decided to just go there to “have a look” and to give some presents to the band and Per – one of these being the Roxopoly game. Well – unfortunately I checked ebay right in time and found tickets for that night. Too cheap to not buy it (15 Euro) and we decided to join the show. But more important were our presents and we had no idea how to hand them over since we didn’t find a particular backstage entrance. I had luck again: my seat was next to the stage entrance for the artists and after the show was over I waited for the band and asked if they could come out to get some presents. They could – and it was damn relaxed that night. We were only around 5 fans, we had all the time in the world to talk and when I showed my Roxopoly to Christoffer he helped us to make Per come out so that I could give it to him directly. Well – the rest you see on the video on YouTube. The show itself was much better than three weeks earlier. Marie’s voice was back, she looked a lot more confident on stage and she even improvised during The Look, bringing the Hey Jude “Na na na na” up for the first time. We loved it. The sound wasn’t very good, maybe because they divided the venue in two parts and the voices just vanished in the “empty” part of the venue. Who knows..! Hard to rate this show, wasn’t the best, wasn’t the worst. The audience was so-so, too. So in the end it was worth the trip because of our presents and just because of that road trip feeling – we love to drive hundreds of kilometres not knowing what will happen when we arrive. But the three of us were happy – both going and coming back home: saturday morning around 4 am. It wasn’t easy to get a ticket for this show. I can’t remember how often I called the Teleticketservice hotline but I can remember that I everytime I hung up I was angry. Well – they have a hotline for international buyers but why the hell don’t the people there speak English? I don’t even know how I long I talked to these Call-Center-people but I remember that I was at the dentist waiting for my treatment. It was a mess and I think it cost me around 12 Euro only to order a ticket. 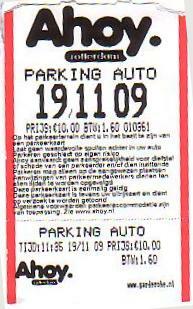 Another 10 Euro I paid for the parking ticket at Ahoy. 10 Euro!!! To park my car for the day? Hmm, Netherlands, I paid 3,50 Euro in Munich – go figure. What I always will remember when I think of the shows in Rotterdam is the way the Dutch and German fans ran for each other and thought about plans how to make it to the front row. It worked – we had a lot of fun, we enjoyed the show, we talked with each other and it felt like something new could begin here. The next thing I remember is that they had closed the left side of the stage so everybody had to run to the right. They opened the left side of the catwalk 15 minutes before the show started and if you weren’t happy with your place on the right you could try it again on the left: risky, of course. It was the first time I saw people pushing for a place in the front row, fortunately the pushing stopped after 10 minutes and everybody was more or less happy. The same goes for the 2nd show on friday, there it was even worse. When I had a look around Ahoy I thought: Hmm, this is Ahoy? I always thought this is something BIG, but it isn’t, hmm. 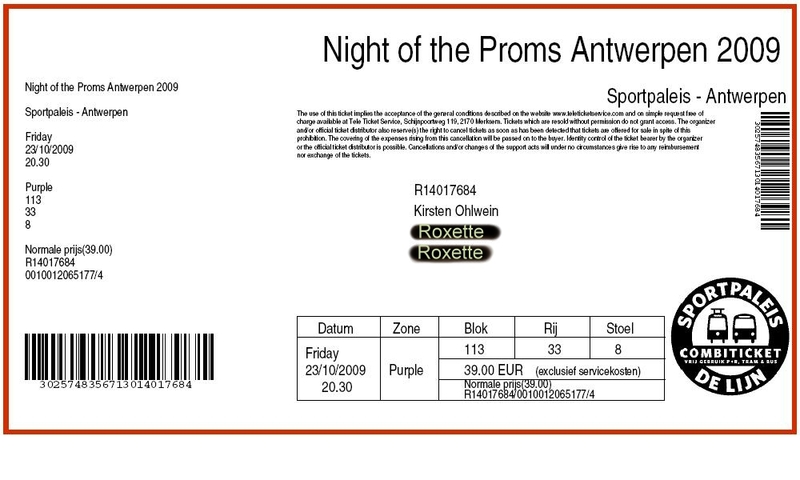 I was quite disappointed about the venue, the audience was so-so, too, so I wondered why everyone always said the Roxette gigs in Ahoy were so HUGE and GREAT. Well, I didn’t understand it. But the show was great. Marie noticed some fans in the front and kept looking at them, Per was in great shape, too. And we had lots of fun, too. I still couldn’t relax during the Midsommarvaka, knowing Wish I could fly would start soon. Well, this didn’t change until the end of the tour. Nervousity was part of me. No entertainment here, just excitement in a not very positive way. On this show we were standing on the right and I had my “Marie, You Rock” banner with me. Tv4 was there, too, and filmed us and the banner several times. We and our Dutch friends made it on the Roxette docu which was broadcast several days later. And the most wonderful thing about Rotterdam was the backstage entrance: no way they could drive away without saying hi, very fan-friendly, indeed. So I got my photo with Marie that night after some – sorry – annoying people had forced her to sign stuff, more stuff, even more stuff. For me it was annoying. Why the hell do you need a signature on every booklet? Isn’t it nicer to say some words, nice words maybe? Instead of wasting time watching the lady sign stuff? But we certainly enjoyed the show, the meeting backstage and the little chat with Per and the band. My last Dutch show which was just WOW, because we decided to take our chances on the left side of the stage that night. I turned out to be something we experienced during the Gyllene Tider tour. If you haven’t seen us running to the front yet, watch this video. We made it – though we had to survive some pushing first. The show was great as all shows in The Netherlands were and my best moment happened to be the seconds before Sharon den Adel entered the stage. The day before I nearly died of a heart attack because of the fireworks just seconds before she comes. I got frightened! I told my friend about it on that night and she was like “Huh, how can you get frightened by that?” Just a second after she said that the fireworks started and she cringed like hell. I couldn’t stop laughing. What a fabulous moment. I can’t remember anything particular about the Roxette performance on that night, so this means that it was neither very bad nor extremely good or better: Outstanding. But I remember I bought the mighty Roxette mug what turned out to be a great idea because they didn’t sell the merchandise in Germany and even worse: The mugs are already sold out in the webshop, too. In the end I have to say: I preferred the Dutch line-up, I preferred the fireworks and pyro, I preferred the audience in Belgium/The Netherlands. I loved how they reacted to the Katona Twins medley, especially when “Smells like teen spirit” started. I loved Sharon den Adel and I loved that she joined John Miles on Stairway to heaven. I think highly of Toots Thielemans, though, I got tired of him in the end. 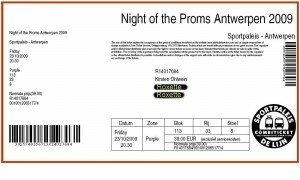 If I go to see a Proms show next year I will plan a trip to Antwerpen. Very nice post! When the overall show was better in BE/NE I’d still think the Rox performances reached their peak in Germany, right? At the shows in Hamburg and Dortmund I never feared Marie to fail, could 100 % enjoy it! The videos got me enough confidence in advance. Nice reading and thanks for scanning the tickets!